It seems only appropriate that my first post on this blog give kudos to an admired Edmonton institution. 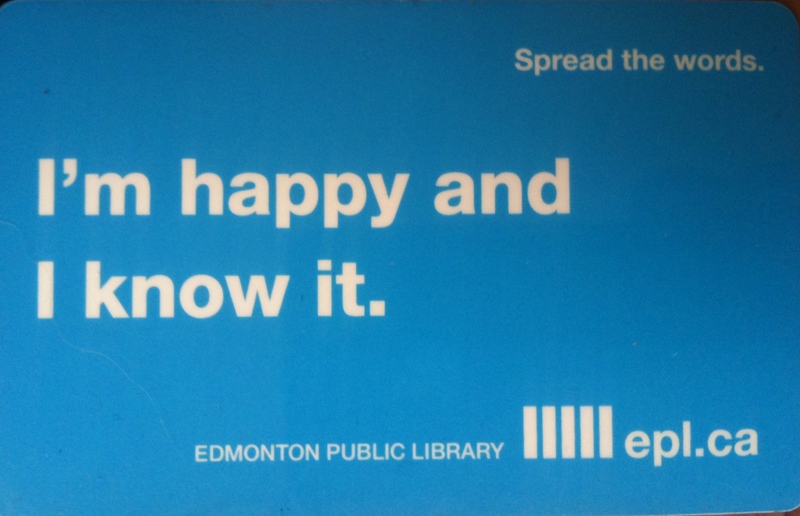 I am taking about the Edmonton Public Library. This week I got a library card – my first one in years, and I am excited! I love learning, I love information and a library offers me plenty of that. Getting a card was very easy. I just asked at the front desk and the very helpful staff took care of me – gathered my information and provided me with the information I would need to know. I have always loved books, I have always loved libraries. I remember as a kid always having a stack of books signed out from the public library and even walking 30 blocks from home to reach the Highlands branch. Over the years I kind of fell out of the public library habit, especially after years of using the libraries at the U of A and NAIT. When a number of years ago , the library started charging for library cards I did not renew my card out of protest. The fee wasn’t much but it was the principle that I was so opposed too. Even today the fee is very fair, just $12 for the year, but I would still rather see no charge at all, so that no one is ever discouraged from borrowing books and learning. Although I have been in the downtown main branch of the EPL a number of times over the years, I did not pay too much attention to the changes that had been taking place. Now with card in hand I did a tour of the two floors of the Stanley Milner Library. One of the first things that I noticed was that there did not seem to be as many books as I remember. There are still a lot, but I guess physical books are just becoming less popular in this age. I had wondered over the years (with a bit of dismay) how/why the library could/would be selling off a bunch of books every year (but I did pick up a number of great bargains for my home library through these sales). The EPL has always been pretty strong in lending alternate media – audio and video in a variety of formats. I see now that they are also expanding there offering of electronic books and even loaning e-readers! Another thing I noticed and was impressed by (but really shouldn’t be at all surprised by) is the self check-out. Last time I signed out a book I stood in line to hand my book and card to one of a number of staff at the checkout counter. Now you do it yourself – scan your card, scan the book, desensitize the security device in the book and get a printed receipt (if you desire) – quick and easy! The final new-to-me (but not all that new, having been around since 1997) is The Alberta Library (TAL) card which you can (and I did) get from your home library to allow borrowing privileges at nearly 300 Alberta libraries including public and university libraries. There will be lots more for me to discover in the Edmonton Public Library in the months to come and I am really looking forward to it!